TEHRAN, Iran (CNN) -- The brother of powerful Iranian cleric Ali Akbar Hasehemi Rafsanjani hailed the latter's upcoming Friday sermon as one that Iranians have highly anticipated and said that a "great turnout" is expected. 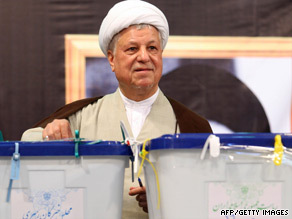 Ali Akbar Hasehemi Rafsanjani casts his ballot for the presidential elections in Tehran on June 12. Rafsanjani, a former president and normally a frequent speaker at the prayer service on Islam's holy day, has not appeared at the weekly sermon since the disputed June 12 presidential vote, according to the semi-official Iranian Labor News Agency. Rafsanjani's absence was seen by many as an indication of conflict within the Iranian establishment. Though he is not expected to speak harshly against the establishment to which he belongs, Rafsanjani's public comments Friday are viewed as pivotal by some political observers in Iran. A key politician, Rafsanjani is the most powerful backer of opposition leader Mir Hossein Moussavi. He heads the Assembly of Experts, the council responsible for appointing or removing the supreme leader, and has become increasingly vocal about the election outcome. Hardliner Mahmoud Ahmadinejad was declared the winner of the election after which government forces cracked down, sometimes fatally, on Iranians who took to the streets to protest. Mohammad Hashemi Rafsanjani, told the semi-official ILNA Tuesday that the "national security of the country is in danger and the wisdom of the country must be used to find a solution to the current situation." The younger Rafsanjani described the possibility of creating a unified moderate front of opposition parties and reminded Iranians that his brother had called for such a front after his own defeat to Ahmadinejad in the 2005 elections. "It seems that social and political conditions to form such a front do exist because the masses who voted for Moussavi are a great force and such people can assist Moussavi is the formation of such a front," Mohammad Rafsanjani said. He said "the trust of the people has been damaged and a wall of distrust has been erected between the people and those responsible for the system." Days ahead of Rafsanjani's expected sermon, the chairman of the conservative Islamic Coalition Party urged the preservation of the forum's "sanctity," ILNA reported. "The uncalculated behaviors of some individuals, with regard to the political events and social ideologies; can have negative effects," Muhammad Nabi Habibi told ILNA. "The trenches of Friday Prayers belongs to the Leadership and the people of Islam. We must safeguard its respect, reverence and independence from political factions, parties and groups and use it only as a forum of our revolution." And a legal scholar told ILNA that the head of the Expediency and Discernment Council must be legally forbidden from holding more than one [official position]. Rafsanjani holds that post as well as heading the Assembly of Experts. Rafsanjani served as president of Iran from 1989 to 1997 and then attempted to position himself in the political center in the 2005 campaign, when he publicly favored a policy that would relax tensions with the United States. Seen in some circles as a kingmaker who was the force behind opposition candidates, including Moussavi and former President Mohammed Khatami, Rafsanjani has called the latest election "a tangled mess, perpetrated by suspicious sources whose objectives are to create differences between the people and the system and eroding the trust of the people in the Islamic system," according to ILNA. "People from across the county participated in the elections, with excitement," ILNA quoted Rafsanjani earlier this month. "But unfortunately, the events that occurred after that and the difficulties created for some, left a bitter taste, and I don't think any wakened consciousness would be satisfied with the resulting situation." Rafsanjani remains an influential figure in Supreme Leader Ayatollah Ali Khamenei's circle, but he has made "a real break with the supreme leader in this case," Iranian-American author Hooman Majd told CNN recently. He was missing when Iran's powerbrokers assembled on June 19 at Friday prayers to hear Khameinei declare Ahmadinejad the winner.